Please refer to our stock # TBD00150 when inquiring. 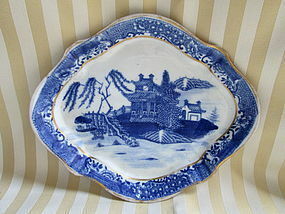 A porcelain teapot stand with a dry base and a blue transferred scene of a Chinese house surrounded by trees on an island. A boat is landing at one side of the island. The raised rim is printed with Chinese patterns, some blurred in the transfer. Bands of gilt are on the top and bottom edges of the raised rim. The rounded trapezoidal shape is relieved with rectangular indentations. Circa 1810. It is 8 inches (20 cm) long, 6 ¾ inches (17 cm) wide and 1 inch (2.5 cm) tall. Condition; No chips, there are three lines in on the back of the rim that are firing flaws and a fourth that is a hairline crack. Otherwise there are a few scratches on the surface and areas of fairly intense wear, like stacking wear, presumably caused by the matching teapot. The gilding is worn substantially where the stand would have been picked up. I am not familiar with this pattern, probably neither Caughley or Worcester, but in the same tradition of printed table wears. Miraculous survivors, those two hundred year old without a blemish are nice, but this piece with its wear and pleasing pattern carries one back to the time when it was in use.